Note: as with any article we write we are told by some that we don’t give enough info, or that we give too much. The intention of this piece is to give you a complete picture with links added for additional information. One of the McDermitt Reservation horses at the slaughter auction. First is the issue of “jurisdiction.” Every activity in the US has a “jurisdiction” that it is “accountable” to. As a simplistic example you would not pay a parking ticket fee to the division of child services. If a crime is committed that exists in a state that falls into a group of laws like “kidnapping” as an example, if the perpetrator stays in the state it is prosecuted within the state, if you cross state lines you have now committed a federal crime. McDermitt Reservation horses at the Fallon livestock auction. This baby is one of our rescues. This issue becomes very emotionally charged partially due to the lack of any unified or consistent “management.” In many instances tribal authorities remove and sell these horses into the slaughter pipeline. Sometimes these removals create a huge public interest and many times happen without any knowledge outside the borders of the reservation. At this moment (5/2014) the Yakima (Yakama) tribes in Washington state are removing and selling horses through a known killbuyer they have worked with before. Sorting and handling of horses that have lived “free roaming” can be a time consuming task. Foals have very little value as meat and some killbuyers simply let them die in pens, or simply shoot them, instead of spending money on feed as there would be no profit in the sale later for meat. So this killbuyer loads the semi trucks with adults and ships them out and then “brokers his by-product,” the foals, to “rescue.” This time around the asking price is $100. a piece. The Killbuyer and broker make a nice handful of cash. This is a recurring thing and happens with regularity. This time they have no BLM roundup to compete with in the press… so it is in the public eye. (As a note the Yakima have been pushing for a horse slaughter facility on tribal land. They have repeatedly refused assistance to PZP treat, train and adopt out their horses). As these horses exist on reservation land the jurisdiction lies with tribal authorities. Fast cash is the name of this one… for the tribe and the killbuyer who gets to turn around and use his profits to buy more horses he can ship to slaughter. We have recently seen similar actions in New Mexico with the Navajo and the Pauites of Nevada. However if the SAFE Act is passed there will be no killbuyer to ship horses across US highways for slaughter. Our litigation is active at this time. We are awaiting final plans from Sheldon to see if adequate measures have been taken to protect the very last of these amazing “war horses” from slaughter. (As a note we have NEVER seen any support for any of the work to protect wild horses, lawsuits or even any outrage coming from Reid’s office as First Amendment Rights are violated and wild horses are run through barbed wire or hit with helicopters. Not one word). So now we have a provision of the Act limited by Congressional authority through “Appropriations,” or what the tax payer actually pays for. However BLM violated the “Appropriations” bill multiple times. In 2012 Wild Horse Education assisted Pulitzer prize nominee Dave Philipps in an investigation that showed 1700 wild horses were not only sold to one kill buyer, Tom Davis, but that the US tax payer had even paid the shipping costs (http://wildhorseeducation.org/1700-wild-horses/). RIGHT NOW we have a huge “anti wild horse” campaign run by those that compete for every blade of grass that grows on public land, the livestock industry. Litigation and multiple PR videos and articles are being written (in what is again an election year where propaganda has a habit of running thick) against wild horses and pushing this notion that “wild horses are over running our western landscape and bringing on the apocalypse” and the only way to “save us all” is to start killing wild horses. Next we have a propaganda storm that includes such gems as “Rangeland Under Fire.” If one believes the message of this documentary then the only alternative we have as a nation to avoid starvation and “taking a wheel barrel full of money to the grocery store to buy a loaf of bread,” (quote from cattle rancher JJ Goicochea) is to get those damn horses off the range. Our narrator cites a national increase in seafood imports as a reason to support cattle ranching on public land… yet he fails to mention profits from cattle sales are at an all time high. 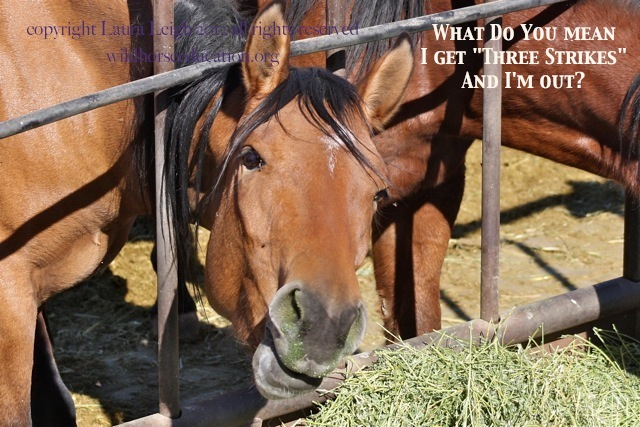 Right now… today… The Appropriations bill (that is a bill passed by Congress making it a law just like any other) forbids the use of any funds for the sale to slaughter or the euthanasia (killing) of a healthy wild horse. Just like subsequent legislation changed the WFRH&B Act, the Appropriations bill (that is a temporary law each year) also changes the manner in which the WFRH&B Act is implemented. Now accountability is always an issue. It is with any law (that is why we have prisons for criminal violations).